As 2017 came to a close, IT infrastructure vendors continued to respond to trends that favored Hybrid IT multi-cloud solutions. Most enterprise IT leaders invested in combinations of on-premises platforms and public cloud-based services. Meanwhile, the cloud hyperscale service providers still drive demand. 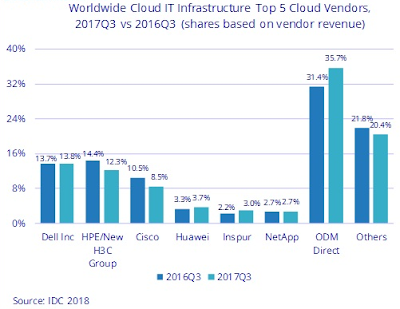 Vendor revenue from sales of infrastructure products (server, storage, and Ethernet switch) for cloud IT -- including public and private cloud -- grew 25.5 percent year-over-year in the third quarter of 2017 (3Q17) reaching $11.3 billion, according to the latest worldwide market study by International Data Corporation (IDC). Public cloud infrastructure revenue grew 32.3 percent year-over-year in 3Q17 to $7.7 billion and now represents 30.2 percent of total worldwide IT infrastructure spending -- that's up from 26.3 percent one year ago. Private cloud revenue reached $3.6 billion for an annual increase of 13.1 percent. Moreover, total worldwide cloud IT infrastructure revenue is on pace to nearly double in 2017 when compared to 2013. Traditional (non-cloud) IT infrastructure revenue grew 8 percent from a year ago, although it has been generally declining over the past several years; despite the declining trend, at $14.2 billion in 3Q17 traditional IT still represents 55.6 percent of total worldwide IT infrastructure spending. Public cloud also represented 68 percent of the total cloud IT infrastructure revenue in 3Q17. The market with the highest growth in the public cloud infrastructure segment was Storage Platforms with revenue up 45.1 percent compared to the same quarter of the previous year, and making up 42 percent of the revenue in public cloud. Compute Platforms and Ethernet Switch public cloud IT infrastructure revenues were up 24.8 percent and 23.2 percent, respectively. Compute Platforms represented 43.9 percent of public cloud IT infrastructure revenue. Private cloud infrastructure revenue was driven by the Storage Platforms growth of 16.1 percent year over year. "2017 has been a strong year for public cloud IT infrastructure growth, accelerating throughout the year," said Kuba Stolarski, research director at IDC. "While hyperscaler providers are driving the lion's share of the growth, IDC is seeing strong growth in the lower tiers of public cloud and continued growth in private cloud on a worldwide scale." Except for Latin America revenue, which grew 5 percent from a year ago, all other regions in the world grew their cloud IT Infrastructure revenue by double digits. The Asia-Pacific region (excluding Japan) and Central and Eastern Europe (CEE) saw the fastest growth rates at 50.1 percent and 35.3 percent, respectively. Canada (22.5 percent) and Western Europe (24.6 percent) had annual growth in the twenties, while the U.S. (18.7 percent), Japan (17.5 percent), and Middle East & Africa (15.8 percent) had annual growth in the teens. With the outlook for cloud infrastructure investment continuing to experience growth, IDC and other analysts anticipate increased demand for Hybrid IT solutions.